The Dead Girls of Hysteria Hall - Read. Travel. Learn. A very refreshing read! What a strange thing to say, to think that this is a horror book. I've already read Katie Alender's Bad Girls Don't Die and to be honest, I did not enjoy it. However, this book got me really curious because of its title. Reading this book, I honestly have no idea what it is about other than there are dead girls in the hysteria hall. The protagonist, Delia, a 16-year old teenage girl who inherited a creepy house from her distant great-great-great grandmother. Delia, according to her parents, is a troubled kid who needs some discipline therefore they'd arranged a vacation to stay in the creepy house. Lots of creepy things happened after that which I never thought I would really enjoy. 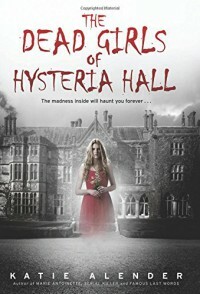 The Dead Girls of Hysteria Hall is really different from the other horror books out there. This book has all the elements I was looking for in a story. It's very well-written and I definitely loved Delia's character, she's a snarky teenager who never failed to amuse me because of her narration. Her voice is so real that I felt all of her emotions. I like the way the author made all the other characters like they are really part of the story, do you know what I mean? They all had their moments and that made me to get to know them better and they all had the biggest part of making this book so awesome. The Dead Girls of Hysteria Hall has the great balance of humor, teenage angst, creepiness and sadness.